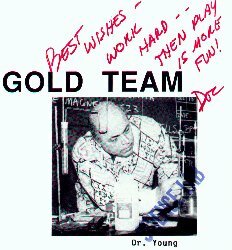 "Work Hard, then Play is More Fun"
Doc's quote stuck to my ribs and I as I got older I started to understand the sense it made in my life. If you work hard, you can get places that allow you to have a lot of fun. By pushing myself, I've seen a lot of cool places, met a lot of cool people, have a lot of cool memories, and make myself some cool money. After working hard to get where I am today, I don't completely agree with Doc. I've reached a plateau of where I can reach by purely hard work. Dr. Young leaves some words of wisdom for the aspiring lad Allen before graduating junior high in 1990. I believe once you reach a certain level of success, you can only reach greater heights by learning handling of people, selling yourself, and your ideas. Thus, "work smarter, not harder" seems to be my coined idea at the moment. Nonetheless, Doc is right. My playtime is spent with weekend excursions to California and Canada, dining at nice restaurants, an annual trip abroad and living in center city.